This months Art Elements design challenge is hosted by the lovely Jennifer Cameron and for her theme she chose seed pods. I’ve used these as inspiration for my work a number of times in the past and I started off with an array of ideas for projects in various mediums. However, for one reason or another I’ve been in a particularly uncreative frame of mind this month. Heatwaves are not helpful as the hotter it gets the slower I go eventually grinding to a halt altogether. Anyway, to cut a long story short I got to this past weekend with nothing sorted so I had to curb my ambitions and cut my cloth accordingly…or rather my polymer clay as that’s what I decided to go with. 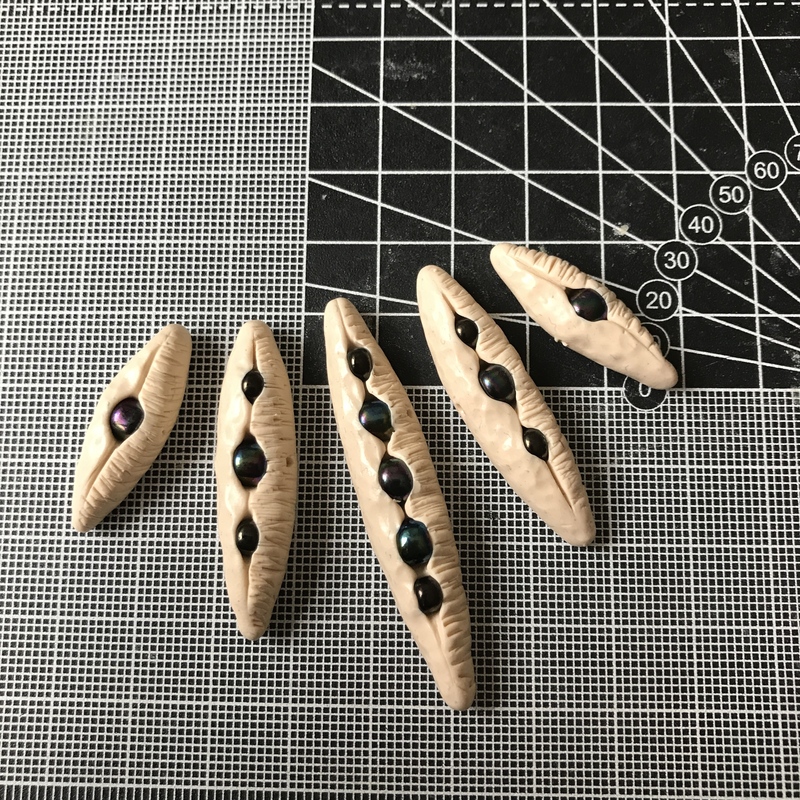 I had an idea to make some seed pods in polymer clay and embed some seed beads in them to give the impression they were about to burst open…my design is purely imaginary rather based on any real seed pods. I don’t have a huge amount of experience with this medium so it’s always a toss up as to whether it works or I end up with a burnt mess! This is how they looked before they went into the oven…a little bit of texture added and holes drilled through the beads. Fortunately there was no over-cooking on this occasion and the seed beads stayed put. Once they were cooled I painted them with an acrylic paint mix, allowed this to dry and then sanded it back to give this worn, mottled effect. There result was a set of beads with a kind of tribal feel – so far so good. I decided to stick with a limited palette and create a simple necklace using ceramic and brass discs to separate the focal beads strung on beading wire. 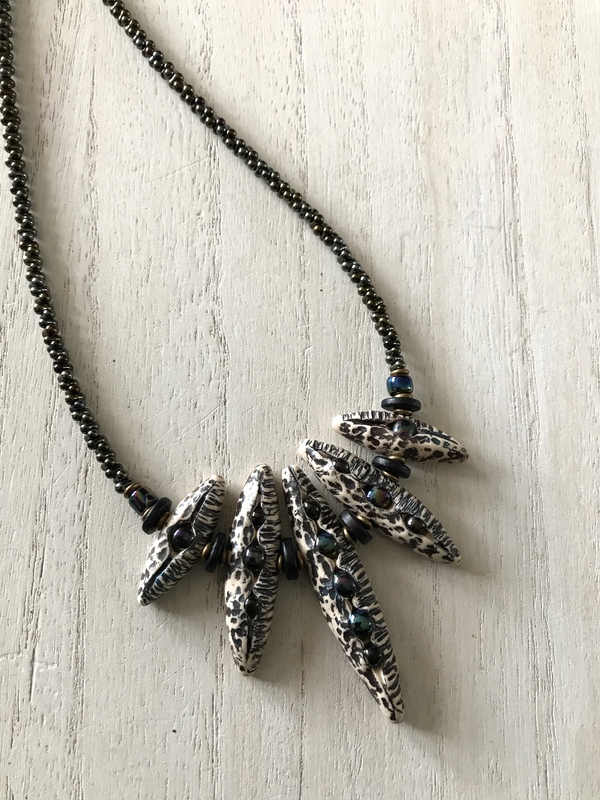 The necklace was then completed with peanut beads in the same finish as the smaller seeds inside the pods. For a speedy make I’m pretty happy with how it turned out and I might even have another go with this idea to see if I can develop it at all. Many thanks to Jennifer for providing us with this months inspiration. To see what the other participants have come up with please join me on our blog hop using the links below. This is gorgeous! The beads are already cool but the necklace is simply stunning! What a stunning effect with the “seeds” showing like that. The necklace is simply beautiful. LOVE, LOVE, LOVE your seed pods! I can’t believe they were a such a speedy creation. They look perfect for this necklace-really love the peanut beads too! I agree these have a very tribal feel to them, which I love! For getting a late start you made some gorgeous pieces. The beads along are really cool but the necklace is a stunner. Nice work!!! What a great idea on your polymer seed pods, yes they have a trial feel! I love how you put your jewelry together, I think I need a class from you! And there’s Lesley all like “let me just whip out these really cool amazing pods in no time at all!” HA! I love them. They are very very cool! And keeping the necklace simple is perfect. Lol – well that’s the beauty of Polymer Clay…can’t do anything like that with ceramics! Since I know your ceramic work, I assumed the pods were ceramic until I began reading and discovered they were polymer. The distressed finish on them is awesome. The texture is awesome. The little seed beads inside are awesome. Everything about them is awesome. But the best part about them is how you used them in that spectacular necklace. Gorgeousness! Your necklace and pods are stunning. Well done! Your “pods” are great! Love your necklace. Both beads and necklace are just gorgeous! Great textures. It’s awesome that you put this together so quickly. Gorgeous necklace, I love how your beads turned out! Polymer is your friend. Its easy and fast… and these turned out great! You know we can do polymer at art camp this year! Hurrah! Your pods make me think of an imaginary alien species that live in pods – traveling in them and breaking out of them when they need to capture another world. Your polymer pods are fantastic and that necklace is just perfect! I really love the design! Wow! They’re amazing… you need to play with polymer more often. Love the final design with them too. Your necklace is so cool! I’m amazed that this was a last minute effort… it doesn’t look that way at all. These are so wild and funky, wow!